The effects of climate change pose real threats to people's health around the world. Droughts, hurricanes, and other extreme weather events jeopardize infrastructure and safety. Rising temperatures cause more smog and longer allergy seasons. 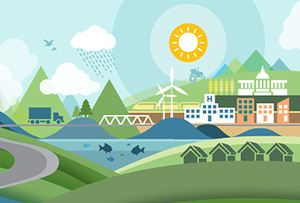 "Esri is committed to helping communities work smarter and more efficiently to become more livable and, as a result, more resilient to climate change," said Esri president Jack Dangermond. Esri will award three winners more than $15,000 in cash prizes or the equivalent in software. The deadline to enter the challenge is August 14, 2015. The app challenge is part of Esri's comprehensive effort in support of the White House Climate Data Initiative under President Barack Obama's Climate Action Plan. "Where people live, work, learn, and play has an enormous impact on their well-being," said Dr. Este Geraghty, Esri's chief medical officer. "Apps should help public and private organizations visualize and understand the impacts of climate change on health."